ICTA Travel Tour to US OPEN! Scotty (front) is President and Founder of ICTA. He directs all ICTA travel tours and mission trips. Scotty loves tennis, lasagna, and all things chocolate. He is married to Melody! Breck (left) works for US Government inspecting nuclear facilities. Breck handles the travel tour business stuff. Breck loves tennis, apple pie, and Tulane University. He is married to Mary and has 2 kids and 3 grandkids! Russty (rt) serves in a Christian church. 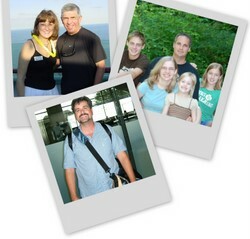 He is an ordained minister who plans our travel tour ministry events scheduling. Russty loves tennis, destroying a rack of baby back ribs, and songwriting. He is married to Jill and has 3 kids! Discover the perfect Faith & Tennis vacation with the experts. In addition to superb fellowship and networking opportunities, our vacation packages include fantastic accommodations, optional air & transfers, special Christian events, exciting activities and uncompromising service. Four nights fantastic hotel accommodations. Come with ICTA members & guests to 2012 US OPEN! With 9 years of leadership in developing world class, large-scale Christian outreaches to famous tennis events, ICTA's founder, Scott Paschal, has built a commitment to outstanding service and premium Faith & Tennis experiences. We truly believe that making your tennis holiday and unforgettable experience is more than a job- it is a Christian ministry passion! Check out online PDF of our tri-fold brochure. Call 386 793 0557 or email teamICTA@yahoo.com or fill out form below for more info. Availability limited! *Prices per person based on double occupancy. Prices subject to change. See brochure.